Climate change threatens to remove the clouds from cloud forests. Four years ago, Dan Metcalfe, a biology professor at Sweden’s Lund University, challenged himself to find a way to physically remove clouds from a small area. The goal wasn’t to win favor with outdoor wedding planners, though. He wanted to determine how a specific type of ecosystem might be affected by rising clouds triggered by climate change. Cloud forests are a kind of rainforest that can be found on high mountains in tropical regions, usually between 2,000 and 3,500 meters (1.2 and 2.1 miles) above sea level. They are frequently shrouded in mist and fog, and this high-moisture air is a vital part of their ecosystem. Climate change models predict that clouds will be pushed higher into the sky in coming years. To determine what impact this could have on cloud forests, Metcalfe decided to try to remove the clouds from a small section of one. 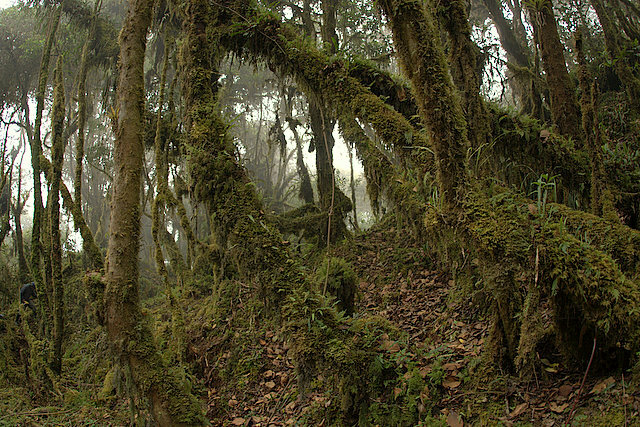 Metcalfe chose the Wayqecha Biological Station, a cloud forest research center in Peru, as the site of his research. He then identified an area approximately 873 square meters (9,400 square feet) in size within the center for his experiment. In October 2017, after years of setbacks that almost forced him to cancel the project, Metcalfe was finally able to complete construction on a mesh curtain designed to stop mist from reaching his study area. Now that the preparation phase is completed, the experiment can begin in earnest. Metcalfe said he hopes to be able to publish a preliminary synthesis and experimental description by mid-2018. If climate change does lead to rising clouds, some of the plant and animal species in cloud forests could be at risk of extinction. Metcalfe’s research could help us start planning for that scenario before it’s too late.